An attempt was made to isolate yeast strains from different sources (flowers, trees exudates, fruits and cheese) which have a fast growth rate and high content of carotenoids. Seventy cultures of pigmented yeast were isolated. 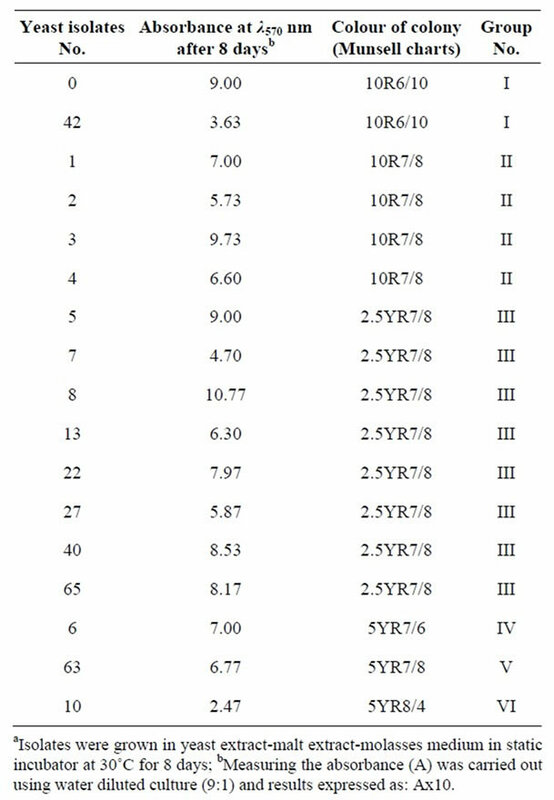 Forty six yeast isolates were selected and identified by simplified identification method which showed that all isolates belong to Rhodotorula glutinis. These isolates were screened in two steps. Seventeen promising isolates of Rhodotorula glutinis were selected after the primary screening. Then 6 yeast isolates were chosen and passed through the second screening. The most promising isolate (isolated from pin cushion flower, Scabiosa atropurpurea) was selected according to its total carotenoids content expressed as torulene (μg·g–1 and μg·L–1). This isolate was reclassified using a number of morphological, biochemical, and physiological characteristics which revealed that the yeast isolate agree well with those of Rhodotorula glutinis var. glutinis. 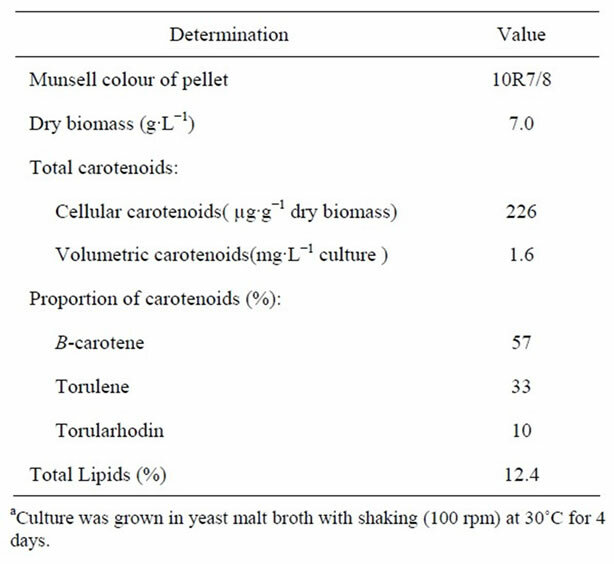 Dry biomass, amount and proportion of individual carotenoids and lipid content of the selected identified yeast were determined. Interest in carotenoids has increased considerably, due in part to the growing evidence of benefits to human health and also to the growth of certain areas of agriculture, especially aquaculture and poultry industry . The utility of carotenoids as anticancer agents , as singlet oxygen or free radical scavengers, as immune response stimulants  and as colouring agents for cooked sausage, soft drinks, baked goods and as additive to cosmetics [4,5] is well known. Microbial synthesis offers a promising method for production of carotenoids. This explains the increasing interest in production of microbial carotenoids as alternative for synthetic food colourants . Several algae (Dunaliella, Dictyococcus and Haematococcus), bacteria (many species of eubacteria in addition to halobacteria in archaebacteria), some filamentous fungi (belong to lower fungi and Ascomycetes), yeasts (Cryptococcus, Phaffia, Rhodosporidium, Rhodotorula, Sporidiobolus, and Sporobolomyces) are reported to produce carotenoids [1, 6-10]. Various species of Rhodotorula were isolated from plant leaves, flowers, fruits, slime fluxes (or exudates) of deciduous trees, soil, refinery waste water, air and yoghurt [9,11-14]. The production of carotenoids by genus Rhodotorula is affected by species, medium constituents and environmental conditions. The amount of carotenoids produced by this genus can be arranged as low (less than 100 μg·g–1), medium (101 to 500 μg·g–1) and high (more than 500 μg·g–1) as reported by many others [9,15-20]. The present study describes the isolation of pigmented yeasts from its natural sources. Identification of yeast isolates and selection of the highest carotenoid producing isolate are also reported. A total of 200 samples were used during this work. Samples of fresh flowers (130), soils (31), tree exudates (11), air (1), Drosophila (1), honey bees (1) and leaves of ficus dicora (1) were collected from many locations in Alexandria, Egypt. Samples of fruits (14), Yoghurt (7), baker’s yeast (1), cheese (1) and sugar cane juice (1) were obtained from local market in Alexandria, Egypt. Yeasts were isolated from its sources using streaking technique on potato dextrose agar, purified and maintained on yeast malt agar and stored at 5˚C [13,21]. Yeast isolates were grown in 250 ml flasks containing 50 ml of the growing medium. Inoculated with 10% inocula (Inocula were prepared by static culture technique for primary screening and by shaking technique for secondary screening using yeast extract-malt extract-molasses medium. Inocula were grown until absorbance value (A) reached 1 at 570 nm) and incubated at 30˚C. Incubation was carried out for 8 days in static culture for primary screening and for 7 days in shaking culture (100 rpm) for secondary screening. Colour of colonies and absorbance at 570 nm were used as criteria for primary screening. On the other hand, total carotenoids were used as criteria for secondary screening. Yeast extract-malt extract-molasses medium consists of (g·L–1): yeast extract, 3, malt extract, 3, molasses, 50 and peptone, 5 with pH 5 was used as growing medium for both primary and secondary screening. Forty six isolates of pigmented yeasts were classified according to the simplified identification method . The most promising isolate was classified in details once more according to the methods currently employed in yeast taxonomy . 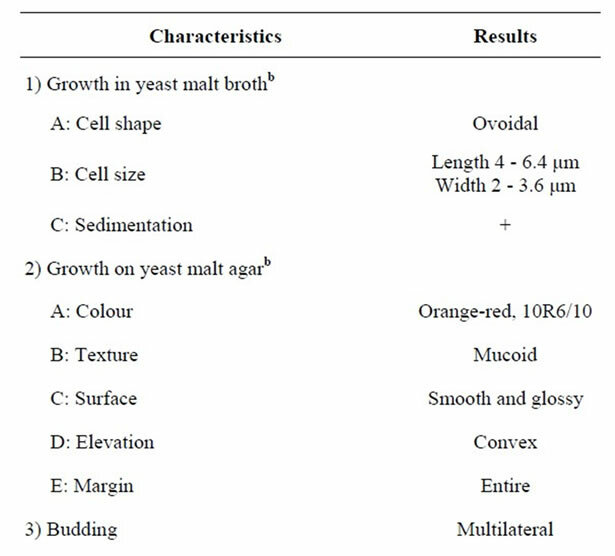 Media used in yeast classification according to the simplified identification method were prepared as described by Deak and Beuchat . All other media used throughout this study were prepared according to Kurtzman and Fell & Van der Walt [13,22]. The colour of yeast pellets and yeast colonies grown on yeast extract-malt extract agar slants was matched by Munsell colour charts . Total carotenoids were extracted from yeast pellets by solvents fortified by butylated hydroxyanisole as antioxidant to minimize the autoxidation of carotenoids as described by Harrd . The absorbance of the hexane carotenoids extract was measured at 485 nm. Total carotenoids content, as torulene, of the yeast cells was calculated and expressed as μg·g–1 of dry biomass and as mg·L–1 of culture. The extinction coefficient of torulene in hexane 2680 was used . The carotenoids extract was concentrated by evaporation of hexane solvent using a stream of nitrogen gas and kept at −8˚C under nitrogen in dark. The crude carotenoids extract was chromatographed on thin layer of a mixture of silica gel G60 and calcium hydroxide (1:1w/w) using 5% benzene in petroleum ether (b.p. 80˚C - 100˚C) as developing system . The separated carotenoids were identified by their maximum absorption [16,27] and also by their Rf values. Atotal carotenoids (450), (485) = The absorbencies of torularhodin free carotenoids extract at 450 and 485 nm. aB-carotene (450), (485) = Calculated constants obtained from absorbencies at 450 and 485 nm and the concentration of standard B-carotene. aTorulene (450), (485) = Calculated constants obtained from absorbencies at 450 and 485 nm and the concentration of standard torulene. CB- carotene (450), (485) = The concentration of B-carotene in torularhodin free carotenoids extract µg·ml–1. CTorulene(450), (485) = The concentration of torulene in torularhodin free carotenoids extract µg·ml–1. Inoculum was prepared in yeast malt broth (prepared as follows (g·L–1): yeast extract 3, malt extract 3, peptone, 5 with pH 5). Yeast malt broth was inoculated with 10% inoculum and culture was grown in an orbital shaker (100 rpm) at 30˚C for 4 days. Cells were harvested by centrifugation and washed with Krebs-Ringer solution. Dry biomass was determined according to Shin and Hang . Total lipids were assayed as described by Jacob . Seventy cultures of pigmented yeasts were isolated from flowers (64 isolates), tree exudates (3), fruits (2) and cheese (1). On the other hand, none of pigmented yeast was isolated from the other sources. Other investigators  reported the isolation of 30 strains of Rhodotorula spp. from saline exudates of deciduous trees. The red coloured colonies of Rhodotorula spp. were commonly found on fruits and flowers . Moreover, Rhodotorula glutinis var. glutinis was isolated from flowers and tree slime fluxes . On the other hand, other authors isolated pigmented yeasts from soils . The seventy yeast isolates were purified and 66 pigmented yeast isolates were selected. The other four isolates were ignored because their colours were white with red top and were considered as non pigmented yeasts. The cultural and microscopic characteristics of the selected 66 yeast isolates were similar. Yeast isolates were transferred to yeast malt agar slants to obtain 2 days old yeast cultures. Twenty pigmented yeast isolates were omitted because they grew very weakly on yeast malt agar. The other 46 isolates were identified by simplified identification method . The examined 46 cultures showed similarity in the main characteristics. They give orange-red to dark red colonies, positive urease reaction and assimilate nitrate coincides with the ability to ferment glucose, assimilate inositol and do not form ballistoconidia or arthroconidia. It can be concluded that all 46 yeast isolates belong to Rhodotorula glutinis according to the simplified identification method. Yeast isolates were screened in two steps to select the highest producer of the red pigment which is known to be of carotenoids nature. Yeast extract-malt extract-molasses medium was used, because it contained sugar cane molasses (5%). Many authors used molasses in media for production of carotenoids by Rhodotorula sp. because of their high content of minerals as well as their cheap price [9,31,32]. Seventeen promising isolates of Rhodotorula glutinis were selected (Table 1). Table 1. The selected 17 promising isolates of Rhodotorula glutinis after primary screeninga. colour of colonies—grown on solid medium—by Munsell charts and absorbance at 570 nm. According to Munsell colour charts, the 17 yeast isolates were divided to six groups as shown in Table 1. One isolate (No. 0) was selected from group 1 (with 10R6/10 Munsell colour) because it had higher absorbance at 570 nm. The absorbance of this isolate (9.0) represent 248% of absorbance of isolate No 42 (3.63). All yeast isolates (No. 1, 2, 3 and 4) in group II (10R7/8) were selected because their colour was darker than other groups (III, IV, V and VI). Only isolate No. 8 was selected from the other groups because it had the highest absorbance at 570 nm. The absorbance of this isolate (10.77) represent 436% of the absorbance of isolate No 10 (2.47) Moreover, isolate No 8 was isolated from cheese while most of the isolates were isolated from flower sources. Therefore, six yeast isolates of Rhodotorula glutinis (No. 0, 1, 2, 3, 4 and 8) were chosen. The six chosen yeast isolates of Rhodotorula glutinis were grown in Yeast extract-malt extract-molasses medium with shaking (100 rpm) at 30˚C for 7 days. Pellets of the 6 selected isolates were harvested at the seventh day (highest absorbance at 570 nm). 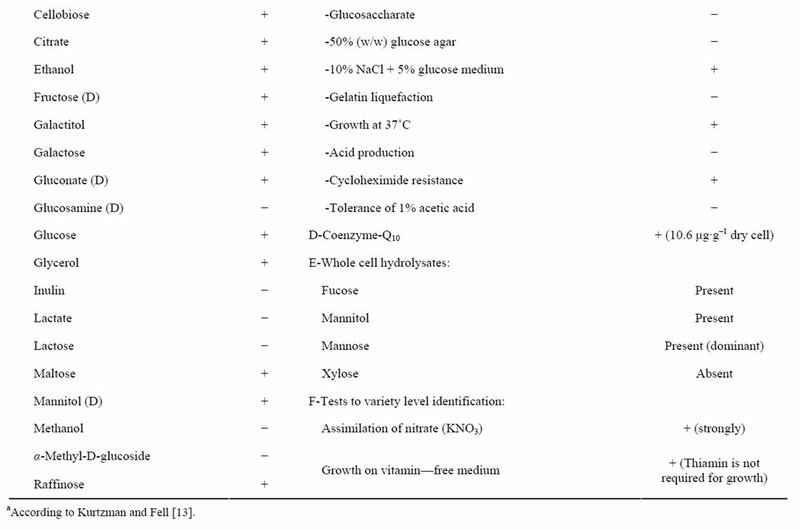 Total carotenoids as torulene (μg·g–1 and mg·L–1) were determined (Table 2). Furthermore, dry biomass (g·L–1) was also measured. Isolates can be arranged descendingly according to the amount of total carotenoids produced as follows: 2, 0, 1, 3, 4 and 8. The amount of carotenoids produced by isolate No 2 and 0 (381 and 221 μg·g–1, respectively) represent 421% and 244% of carotenoids produced by isolate No. 8 (90.4 μg·g–1). Isolate No. 2 was selected at first (highest content of carotenoids). However, isolate No. 0 has priority over isolate 2 and chosen for further study because it has constant growth rate and it is stable during repeatedly transferring (transferred up to twenty times on yeast malt agar slants). This selected isolate was isolated from pin cushion flower (Scabiosa atropurpurea). 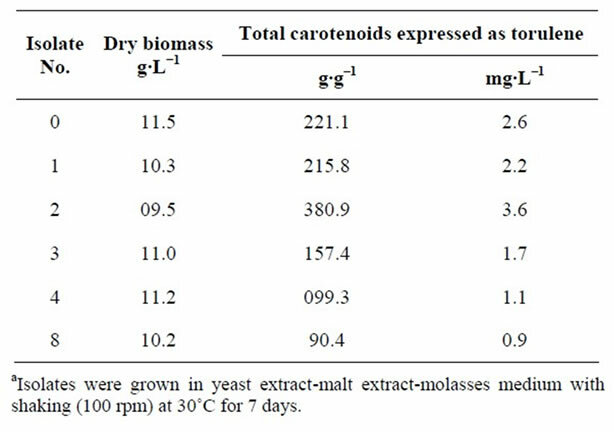 Increase of dry biomass did not indicate about the increase of total carotenoids (Table 2), this finding is in agreement with that reported by other investigators [15, 33,34]. The selected isolate No. 0 was reclassified . The isolate was grown in yeast malt broth and yeast malt agar at 25˚C for 3 and 30 days. Growth characteristics (Table 3) revealed that the cells of the isolate are unicellular, ovoidal with multilateral budding. Additional tests for classification of the isolate to the levels of genus, species and variety were carried out and the results are presented in Tables 3 and 4. 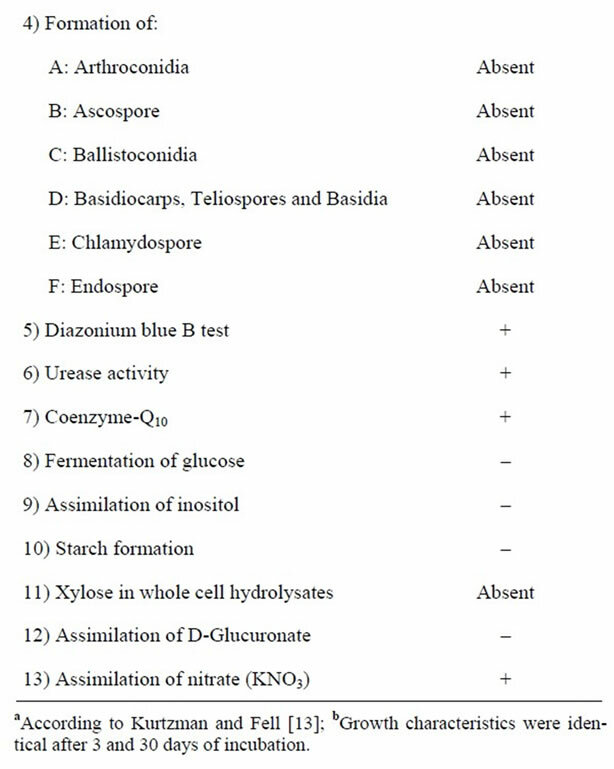 The studied characteristics of yeast isolate No. 0 agree well with those of Rhodotorula glutinis var. glutinis . Table 2. Secondary screening of the chosen 6 isolates of Rhodotorula glutinisa. Table 3. Testsa used as key to genus level of isolate No. 0.
was carried out using yeast malt broth. This medium was recommended for production of carotenoids from Rhodotorula glutinis . Table 5 shows Munsell colour, dry biomass, amount and proportions of individual carotenoids and total lipids of the most promising isolate Rhodotorula glutinis var glutinis. This carotenoids concentration is higher than that reported by some workers [15-17,21,34]. The selected isolate is a promising one for production of carotenoids. Table 4. Testsa used as key to species and variety levels of isolate No. 0. Table 5. Munsell colour, dry biomass, amount and proportion of individual carotenoids and total lipid content of Rhodotorula glutinis var glutinisa. 266 μg·g–1 cellular caroitenoids, 1.6 μg·L–1 volumetric carotenoids, and contained 12.4% lipids, after growing in yeast malt broth with shaking (100 rpm) at 30˚C for 4 days. E. A. Johnson and W. A. Schroeder, “Microbial Carotenoids,” In: A. Fiecher, Ed., Advances Biochemical Engineering Biotechnology, Springer-Verlage, Heidelberg, Vol. 53, 1995, pp. 119-178. J. C. Bauernfeind, “Carotenoids, Colorants and Vitamin A Precursors, Technological and Nutritional Applications,” Academic Press, New York, 1981, p. 938. M. A. Borowitzka, “Micro-Algae as Sources of Fine Chemicals,” Microbiological Science, Vol. 3, 1986, pp. 372-375. L. Ninet and J. Renaut, “Carotenoids,” In: H. J. Pappler and D. Perimen, Eds., Microbial Technology, 2nd Edition, Academic Press, New York, Vol. 1, 1979, pp. 529-544. A. Oren, “Review: A Hundred Years of Dunaliella Research 1905-2005,” Saline Systems, Vol. 1, No. 2, 2005, pp. 1-14. L. Dufossé, “Microbial Pigments, Encyclopedia of Microbiology,” 3rd Edition, 2009, pp. 457-471. H. J. Phaff, M. W. Miller, M. Yoneyama and M. Soneda, “A Comparative Study of the Yeast Florae Associated with Trees on the Japanese Islands and on the West Cost of North America,” Proceeding IV, IFS: Fermentation Technology Today, Osaka, 1972, pp. 759-774. T. Deak and L. R. Beuchat, “Handbook of Food Spoilage Yeasts,” CRS Press, New York, 1996, pp. 111-154. C. P. Kurtzman and J. W. Fell, “The Yeasts, a Taxonomic Study,” 4th Edition, Elsevier, Amsterdam, 1998, pp. 77-102. V. Perrier, E. Dubreucq and P. Galzy, “Fatty Acid and Carotenoid Composition of Rhodotorula Strains,” Archiv für Mikrobiologie, Vol. 164, 1995, pp. 173-179. J. P. Van der Walt, “Criteria and Methods Used in Classification,” In: J. Lodder, Ed., The Yeasts, North-Holland Publishing, Amsterdam, 1970, pp. 34-113. E. Stahl, “Thin-Layer Chromatography, A Laboratory Handbook,” Academic Press, Inc., Publisher, New York, 1969, pp. 210-343. Y. Pomeranz and C. E. Meloan, “Food Analysis, Theory and Practice,” AVI Publishing Company, Inc., Westport, 1978, pp. 65-67. C. T. Shih and Y. D Hang, “Production of Carotenoids by Rhodotorula rubra from Sauerkraut Brine,” Lebensmittel-Wissenschaft und-Technologie, Vol. 29, No. 5-6, 1996, pp. 570-572. M. Ozawa and M. Takahashi, “Isolation of Carotenogensis Suppressing Substance in Yeast Extract for Rhodotorula yeast,” Bulletin Faculty of Agriculture, Meiji University, Tokyo, Vol. 100, 1994, pp. 53-59.